Trans* Awareness Week | What's that, UASC? Trans* Awareness Week is being celebrated at the University of Saskatchewan from March 29 – April 4th, as part of a wider array of events taking place province-wide. Today, March 31st, marks the 7th annual International Trans* Day of Visibility which celebrates Trans* people, and raises awareness about discrimination. Discrimination in all of its forms is best fought by understanding, accepting, and ultimately looking past differences. 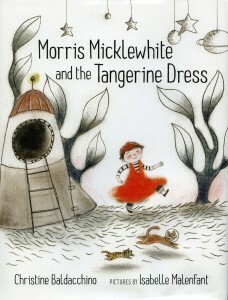 In recent years, we have seen the development of Trans* children’s literature aimed at doing just that. In honour of Trans* awareness week, UASC shares some examples of these books from its Neil Richards Collection for Sexual and Gender Diversity . 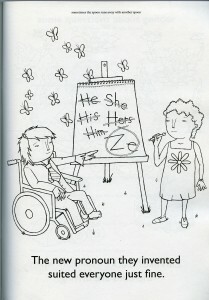 Also featuring Trans* themes is Jacinta Bunnell and Nathaniel Kusinitz’s coloring book Sometimes the Spoon Runs Away With Another Spoon. This small, quirky volume is dedicated to “everyone who has ever felt left out,” and features an array of images of trans youths and queer fairy-tale figures doing the things that make them happiest. From tie-wearing little girls who love trucks and dinosaurs to dolled up little boys who would rather play house, the coloring book provides a healthy, creative space where gender norms are constantly challenged. 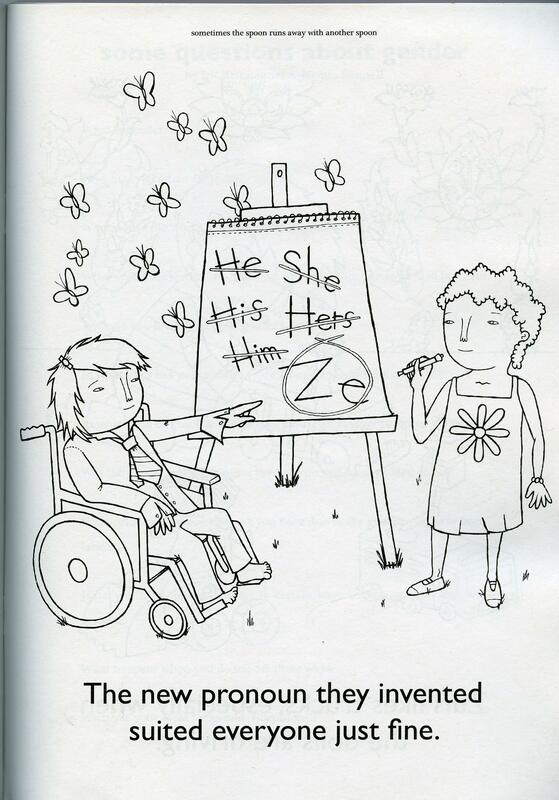 It also includes a page at the end asking some questions about gender—questions which would do well being considered by the young and old alike. These texts not only foster awareness and acceptance of gender diversity in young people, but also provide assurance to young people who may be struggling with their gender identity that they are not alone. As children begin to explore their gender identities at younger ages, the production of media creating safe and supportive spaces for this exploration will become both more common, and more crucial. See these and other Trans* youth books at the University of Saskatchewan Library! Coyote, Ivan E. One in Every Crowd: Stories. Vancouver, B.C. : Arsenal Pulp Press, 2012. Espejo, Roman. Transgender People. Farmington Hills, Mich. : Greenhaven Press, 2011. Ewert, Marcus and Rex Ray. 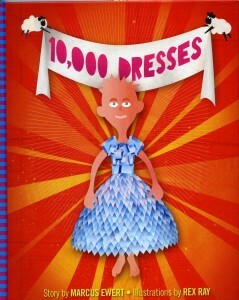 10,000 Dresses. New York : Seven Stories Press, 2008. Kilodavis, Cheryl. My Princess Boy. New York : Aladdin, 2011. McLaughlin, Laureen. Cycler. New York : Random House, 2008. This entry was posted in Archival Holdings, Richards Collection on March 31, 2015 by Stevie Horn.